I am all up for a new year’s health kick, starting the day with juice cleanses, vegan bowls and super food salads – all eaten on the go, but just sometimes breakfast needs to be an event. England is famous for it’s breakfast and London is where to explore the higher end of the days’ first meal. Céleste, The Lanesborough’s Michelin-starred fine dining restaurant is the perfect venue for a luxury breakfast. This opulently decorated dining hall, with domed glass roof and grand chandeliers sets the scene for beautifully constructed dishes, overseen by Executive Chef Florian Favario. I can’t see a better way to start the day than pancakes with hand-picked Cornish crab, finished with green apple, purple shiso cress and hollandaise. For a breakfast venue, The Delaunay on Aldwych takes some beating. This is a true Grand Café, oozing with Mitteleuropean elegance. Seated at a black marble table, with a backdrop of dark wood deco panelling, is exactly where you want to find yourself for the first meal of the day. Busy, yet spacious, the floor staff are professional and attentive. Coffees are works of art, and the eggs Arlington close to perfection. For those with a sweet tooth, The Delaunay offer a delicious selection of pastries, all handmade by an in-house team led by Head Pastry Chef, Regis Negrier. These are also served next door, in their traditional Viennese café, The Delaunay Counter. 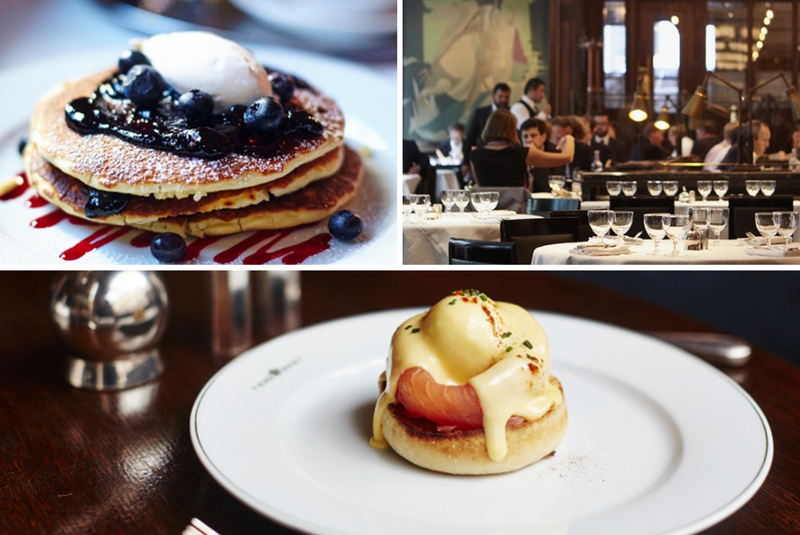 The Bloomsbury’s Dalloway Terrace is designed for a real breakfast. Light and airy and adorned with hanging foliage, it has something of a colonial atmosphere. The waiters in their smart, white jackets serving real tea from silver teapots only reinforcing this feeling. When dining at The Bloomsbury, you have to go for the Dalloway Full English. Each component is cooked to perfection. It’s always a challenge to make an English breakfast look sophisticated, but something the chefs here manage to achieve. I also like the anglo-eire twist of using Clonakilty black pudding. Just a stones throw from the hustle of Soho, this little gem is perfect for a relaxed morning meeting or to refuel before hitting the shops. The Wolseley, standing imposingly on Piccadilly, has got to be one of London’s most iconic breakfast venues. With an impressive history of famous diners to have feasted at its tables, AA Gill even wrote a book about breakfast here! The Magnificent façade gives way to a lavish interior where one can indulge themselves in such decadent delights as devilled kidneys with mustard butter. More traditional fayre is also served, along with a well-stocked, classic Viennoiserie. Perfectly situated in the heart of the capital. Sitting in the grandeur of this cathedral-like space takes one back to another era, more than just a meal, where breakfast was an occasion.